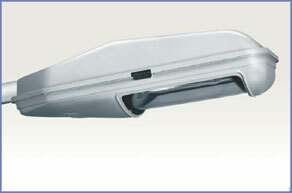 This new generation of street lights enjoy 21 light distribution curves, heat and strike proof glass with appealing sight and aerodynamic design.implementing High Tech, IP66 optical compartment, opening the compartment door side up which lower the service and maintenance cost are the other advantages of this brand of light. Body: Die-cast aluminum, painted with electrostatic powder coated, after choromated treatment. Metallic Piece: Galvanized steel or Stainless steel. Finish: Gray RAL7038 (other color on request). 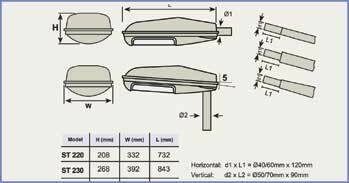 Ingress Protection: IP66 for optical compartment and IP44 for Body Compartment (IP54 on request). Installation: Bracket, for side or entry 40 up to 60mm. & for vertical entry 50 up to 70mm. Maintenance: Easy access to the control gear by pressing on the spring fastener and raising the cover, no tools needed.